Musicians in Nagaland join hands to help the Kerala flood victims. They will be performing in at the ‘Nagaland4Kerala’ concert on August 24. 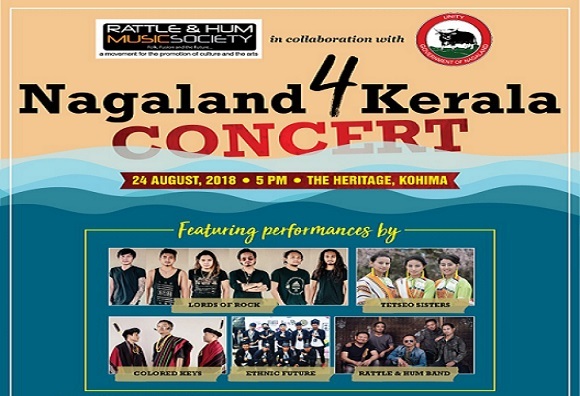 The concert has been organized by Rattle & Hum Music Society of Nagaland in collaboration with the government of Nagaland at the Heritage Kohima. Meru said the amount collected from the concert will go to the relief fund for Keral flood victims. “Whatever we get from the concert, we will be sending it for Kerala flood victims,” he added. The concert will showcase six special performances by popular bands and artist of the Northeast including Rattle & Hum, Lord of Rocks, Tetseo Sisters, Coloured Keys, Ethnic Future and Muno Shiu. Bank and online contribution can be made to Rattle & Hum Music Society IDBI Bank, Kohima branch account (No 1147102000001748). The society will accept contributions till August 30.